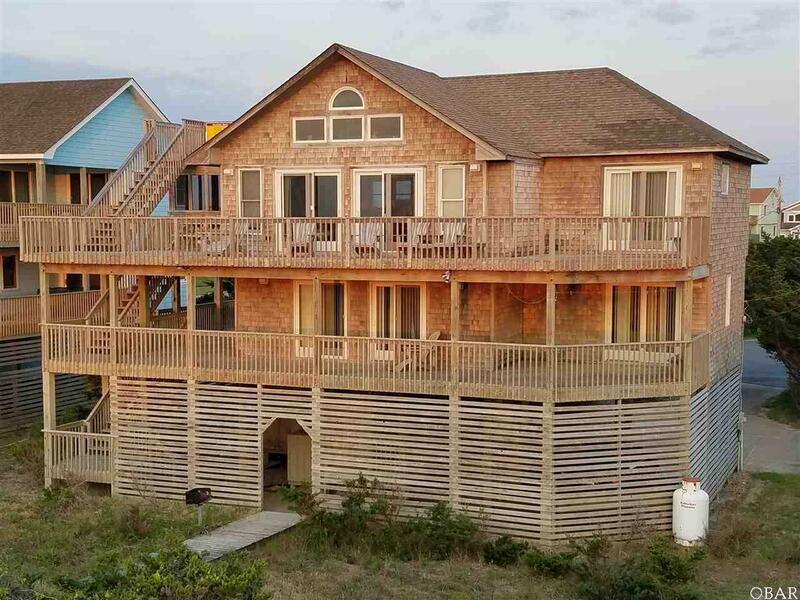 40296 Moore Way, Avon, NC.| MLS# 100470 | Outer Banks Homes For Sale, North Carolina Home Search Including Nags Head, Pirates Cove, Manteo, Kill Devil Hills Kitty Hawk, Southern Shores, Duck, and Corolla North Carolina, Oceanfront and Soundfront properties for sale and long term rentals. Wake up each day to the sun rising over Mother Ocean! Great opportunity for a custom built 5 bedroom, 5.5 bath home located in the heart of Avon on a quiet cul-de-sac close to the Fishing Pier, shopping and restaurants. The views are endless from the three levels of decking going from bedroom level to the roof top deck and each of the five bedrooms have direct deck access. A bonus office/bunk room is located on the first level. This turn-key popular rental is furnished complete with hot tub on the screened porch. Make this your very own special vacation home in sync with the endless beauty of Mother Ocean.